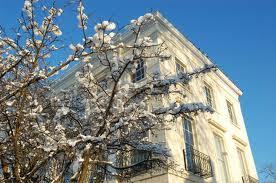 At its General Meeting in April 2007, the Association approved a Trees Policy, which records the great contribution that trees of many kinds make to the charm of our area, and which includes action to protect, sustain and bring more trees to the street scene. The policy statement is supported by a record of all the trees, both public and private, in our area. We are now actively pursuing this policy. This includes work with local authority officers in care for street trees and the planting of more such trees where local residents would welcome them; and support to owners of private trees. By agreement with Cheltenham Borough Homes, we planted three birch trees, three mountain ash (rowan) trees and several hundred crocus and daffodil bulbs in the grounds of Mellersh House, on Painswick Road. The rowans have not flourished and we are currently looking at a replanting job with a Norway maple. We have planted shrubs and bulbs in the green margins of Grafton Road and maintained the area since. We have worked with Gloucestershire County Council (as highways authority with responsibility for street trees) on a pilot project to plant new trees to fill the gaps in the historic avenue on Grafton Road. Our role will be to share the costs, and to maintain the trees once planted. This project, which was undertaken in late 2011, used the Trees fund that we have raised. We have watered the trees every summer since, using our water cart. Even so, were sadly not consulted when Glos. Highways decided to fell a large (they said dangerously diseased) horse chestnut in December 2013. A few weeks later, two trees - a mature sycamore and a young chestnut - were destroyed in a storm. All three trees have been replanted in the winter 2014-2015, plus a new one too - see front page story. 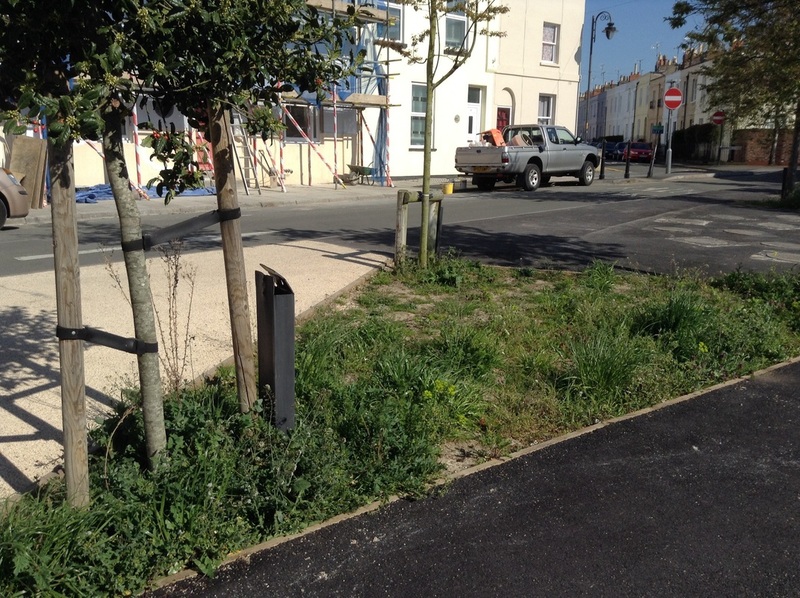 Our achievements in getting 10 trees planted in the Bath Road and three in Suffolk Street are reported on our home page. Colin Davies is currently coordinating a project to identify places for more trees in our streets, encouraged by a recent meeting with Gloucestershire Highways. In December 2006, we established a successful programme of cooperation with Cheltenham Borough Council to secure the cleaning of street surfaces and drains on the streets in our area, many of which had not been cleaned for several years. This has now become an annual routine. The actual cleaning is done by Borough Council staff and machines. Our role has been to deliver advance notices to all residents of the streets affected; to offer addresses of residents whose gardens can be used to stockpile 'No parking' cones; and to place these cones along the streets, late at night or in the early morning, in order to discourage parking during the chosen day. Litter is a tiresome, ever present problem . The Council's street cleaning services are not sufficient to keep the streets free of litter. So from March 2013, SPJARA is organising a periodic litter pick of the streets in our area. If there is any problem that needs sorting out, contact Adrian Phillips (adrian.phillips@gmx.com). And we ask anyone to pick up litter and put it in a bin. The Association receives each week a list of new planning applications received by the Borough Council. We comment only where we perceive a significant threat to the amenity look of our area, or where we think that a particular proposal merits our support. Formal comment will only be made where it is judged, after consultation with both the applicant and the neighbours most directly affected, that a proposal would have damaging affect on the general amenity of the area or serious adverse impact on neighbours, or would set a damaging precedent which others might follow. Each formal submission will be subject to prior approval by the Committee; and, once made, will be reported on the Association’s Website. This policy will itself be made plain on the Website and in the next Newsletter. You can see comments sent to Cheltenham Borough Council since August 2012 for 6 Park Place and 17 Andover Street by clicking here and here. Just as with planning proposals, we receive weekly notice of the applications affecting trees in the SPJARA area. As all our area is within a Conservation Area we hear of all these, not just those affecting trees with Tree Presevation Orders. We comment on those applications for felling or tree work which we feel will affect the area. Colin Davies co-ordinates this work for us. For some time, we were concerned about the poor condition of the land behind the garden of the Exmouth Arms, adjoining St Philips Street. This land is owned by Arkells Brewery. In late 2006, without securing planning approval, the pub tenant scraped off the topsoil and created a clinker-surfaced car park. Local residents, supported by the Association, pressed the Borough Council to take enforcement action against the tenant. This was done, and the clinker was in due course covered over with soil and re-seeded. But the seed had not taken well, the site was still used on occasion by vehicles, weeds had grown on the outer parts, and the trees surrounding the site were in bad condition. The Association therefore asked the Borough Council to do what it could to secure better maintenance of this very prominent site. In 2007, discussions took place between the Borough Council, the Bath Road Traders' Association, ourselves and the owner and tenant of the land. Since then, a new tenant has refurbished the pub and the front garden; parts of the boundary wall have been rebuilt, most of the trees have been pollarded, and the backland has been redeemed and turned into allotments, which is an admirable echo of their use during the 'Dig for victory' campaign of World War II. 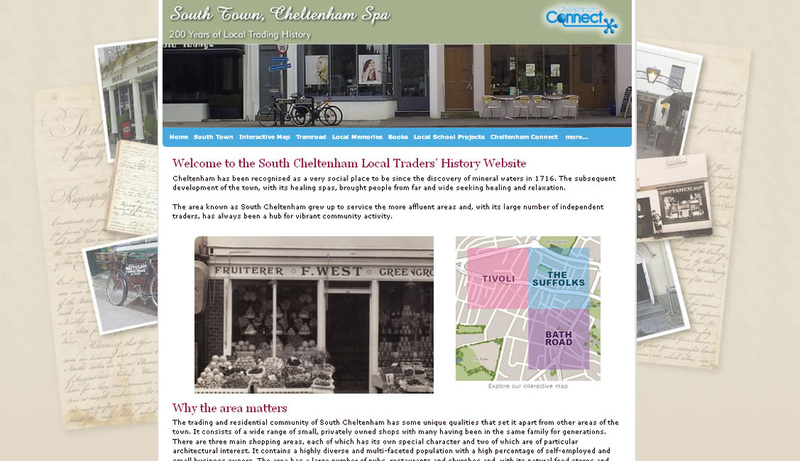 During 2006 and 2007, the Association worked on local history project with the Leckhampton Local History Society which culminated in an Exhibition in St Philip and St James Church, explaining the development of the area. Over 500 people attended the exhibition. Since then we have arranged more showings of the exhibition in other venues and published the Local History leaflet (see below). 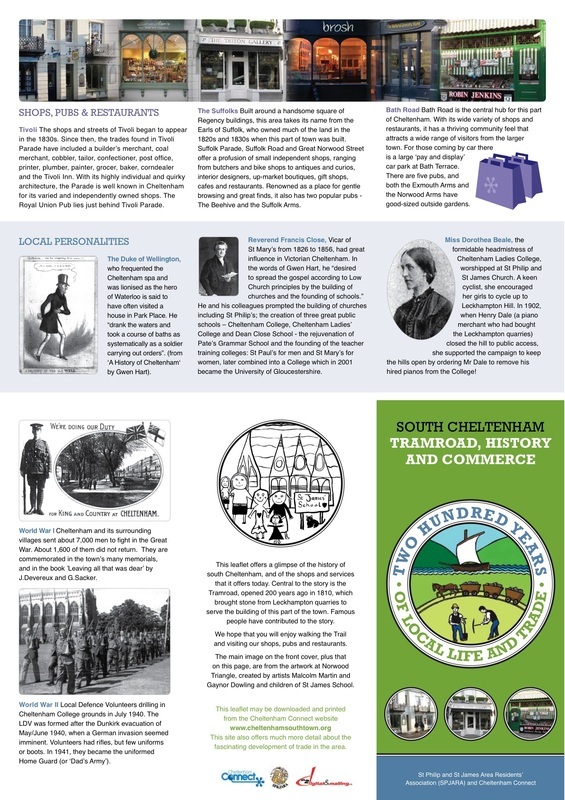 To coincide with the opening of the Norwood Triangle (see below) we produced an illustrated leaflet, 'South Cheltenham Tramroad, History and Commerce' which tells the history of the area and offers a self-guided trail round its key features. Funded by us and a generous local donor, we produced this jointly with Cheltenham Connect. 4000 copies were printed and have been widely distributed. You can download and print the leaflet at the Cheltenham Connect local history website: www.cheltenhamsouthtown.org. As a direct sequel to the Norwood Triangle project, the Association secured a grant of £3,500 from the Big Lottery to pursue an Oral History project, undertaken in association with four local primary schools. The children worked with older people, asking them for their memories. These and the children’s reactions can be seen here www.cheltenhamsouthtown.org. Much of the above is consolidated on this web site: http://www.cheltenhamsouthtown.org/. This is has been created and is funded by the south Cheltenham community initiative, Cheltenham Connect. It tells the fascinating story of this very special area, with the three shopping areas that are near SPJARA residents: the Bath Road, the Tivoli area and the Suffolks. Included on the web site, which is now being re-designed and updated by Stuart Manton, is a copy of a book about the oral history project 'Exploring Local Memories' - click here. In 2007, the Association was invited by the Borough Council to comment on its borough-wide Green Spaces Audit. This made us realise that we had no publicly-owned green space in our area. What we did have was a triangular space, at the junction of Gratton Road, Upper Norwood Street and Norwood Road, which (as our Local History exhibition had shown) was historically a focal point on the Tramroad which, from 1810 to 1861, brought stone into Cheltenham from the quarries on Leckhampton Hill. 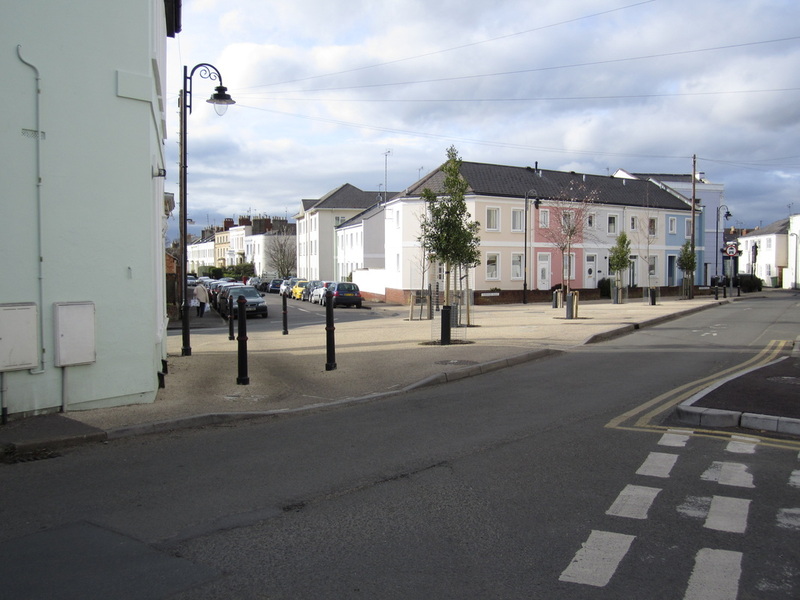 At 2007, it had become an ugly traffic island, cluttered with a mass of bollards designed by the Borough Council engineers to keep cars off. We told the Borough Council that we would like to see it made much more attractive; and we invited one of our members, retired landscape architect Frank Shaw whose house overlooked this space, to prepare ideas. These ideas were discussed with officers of the Borough Council and Gloucestershire Highways, and we reached agreement with them on proposals for improvement to this area. These proposals were then discussed with local residents in September/October 2007, and the scheme was adapted in the light of their comments. - celebrate the historic role of this space, as a junction on the Cheltenham and Gloucester Tramroad and a focal point of this neighbourhood : 2010 would mark the second centenary of the opening of the Tramroad, and we aimed to realise the full project by then. 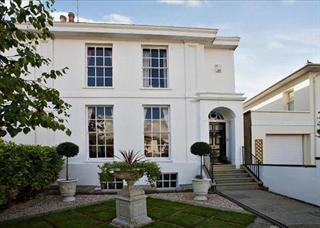 The overall cost of the renovation was about £80,000. Towards this, Cheltenham Borough Council had pledged £32,000. The Association set in hand a fund-raising campaign to raise the remaining £48,000. After approaching many foundations, we secured £43,500 from the Big Lottery's Community Spaces programme, and £500 from The Rowlands Trust. We raised the remaining £4,000 by holding an Auction of Promises and a Jazz Party.
" Resurfacing the pedestrian area in resin-bonded stone. In autumn 2012, an interpretative panel was installed with information about the area and the tramway. In 2013 and 2104 the Council generously donated two large flower containers. The work was completed just in time for the formal opening of the Triangle on 3 July 2010, the precise bicentenary of the opening of the Tramroad in July 1810. A crowd of over 200 people came to watch the Earl of Suffolk and Berkshire (four greats grandson of the man who laid the first stone sleeper of the Tramroad in 1809) unveil a plaque mounted on the building that used to be the Railway Inn, overlooking the Triangle. The Triangle was dressed with bunting for the occasion, the choir of St James School sang, and a jazz band played. On the same day, we mounted again in Bethesda Hall the Local History exhibition of three years earlier, accompanied by drawings for the Triangle's artwork made by St James School children and the artists Malcolm Martin and Gaynor Dowling. 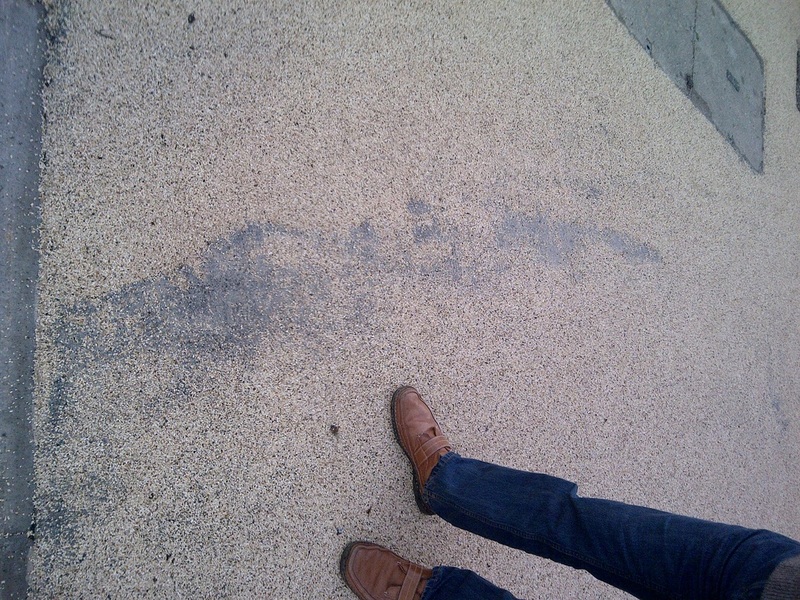 While we were pleased to see the scheme take shape, we were very disappointed by the poor quality surfacing (the so-called resin-bonded stone) that the council's contractors have used. It wore badly, looked cheap and has needed to be patched to make it drain properly. We were promised by Gloucestershire Highways and our local councillors that they would remedy this during 2014 with a re-surfacing job and a new design (see Home Page). That was good news, and the work began in August 2014. As you can see on the Home Page, the re-surfacing too has run into problems. The saga continues and what was a bold scheme undertaken with strong community support has become a source of disappointment and frustration.